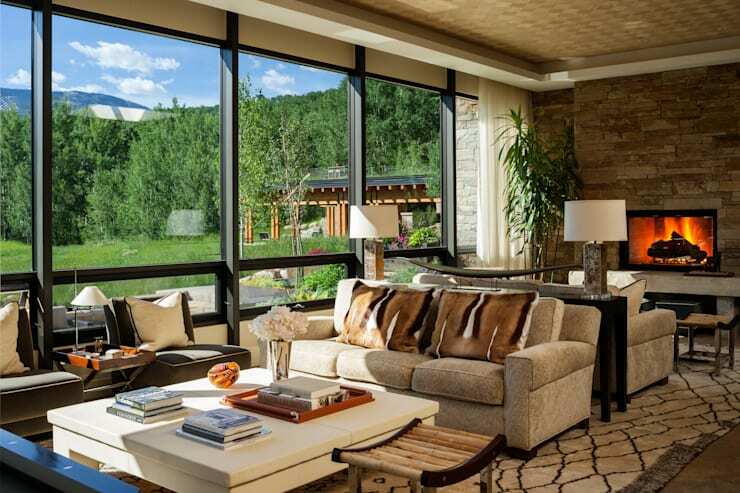 This scenic ranch enjoys the visual splendor of Vail Valley, Colorado. A rural paradise for outdoor recreation, this home enjoys year-round access to activities such as hiking, fishing, and skiing, offering a total escape from the hectic buzz of daily life. 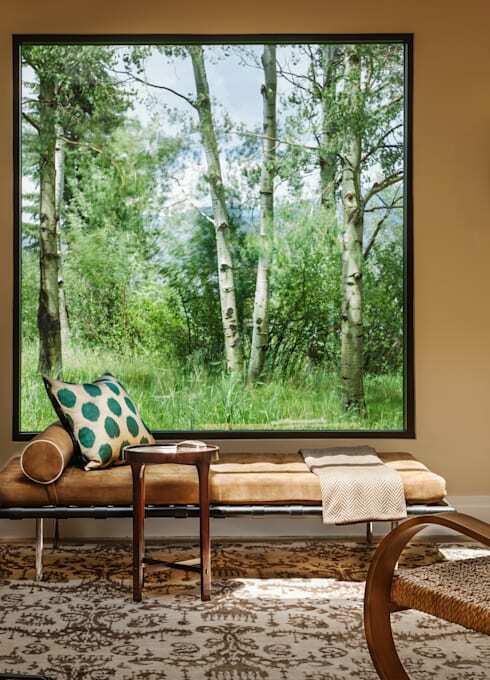 Inside, this space has been decorated by the designers from Andrea Schumacher Interiors with wild prints and organic materials that reflect a sense of wilderness, with numerous outdoor features for enjoying everything that nature has to offer. 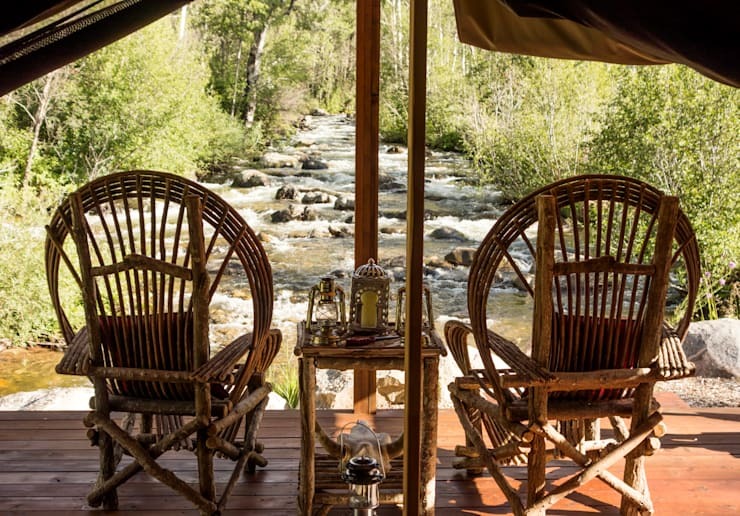 Complete with terraced sundecks and even a creekside yurt, this nature-inspired getaway merges simple rusticity with modern luxury—an outdoor enthusiast’s dream come true. Multiple terraced levels offer up a variety of outdoor spaces serving various functions, with ample space for a large dinner party, informal picnic, fireside chat, or a soak in the Colorado sunshine. Conforming to fit the sloping hillside, the building finds separation between areas by using level distinctions. 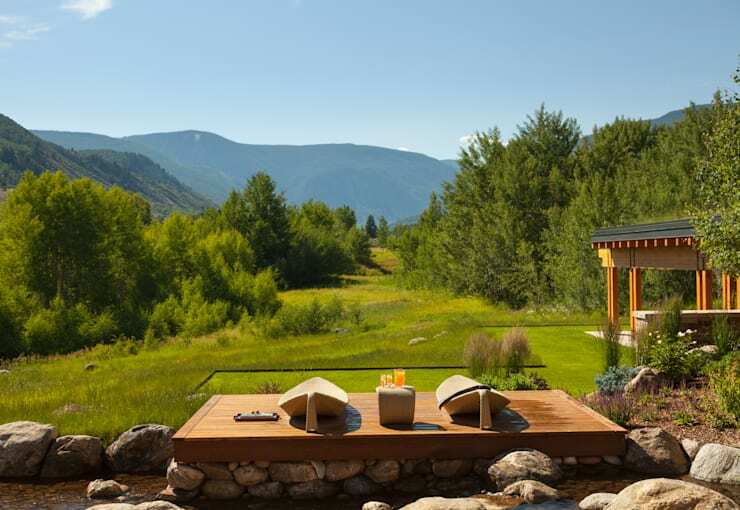 A view from the patio shows Vail Valley in all of its summer beauty, with a pair of laid back, hammock-like patio chairs for taking a nap in the afternoon sun. 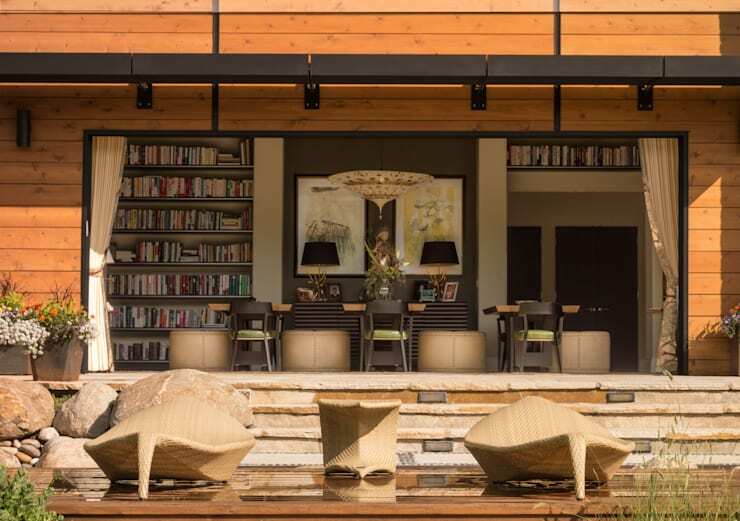 Designed for enjoying the outdoors, a peek into the home’s interior shows a small library that can be opened up to become one with the patio, extending nature’s influence over the interior of the space. Fitting for a group getaway or family reunion, this vacation space offers up ample living room seating coupled with breathtaking views. The decor sticks to earthy tones and natural materials, with unfinished wood, rough stone, and animal fur contributing to a wild and rugged vibe. After a day out in the mountains, this windowside spot offers a delightful atmosphere for a quiet rest. Filled with imagery of trees, branches, and wildlife, this living space unites a mismatched array of prints and textures under a common theme of warm beige. The bedroom takes on a more sophisticated and elegant role, playing up a richly patterned theme that turns the room into an artistic and dynamic space. Beautifully bold, this room demonstrates the beauty of life’s variety. 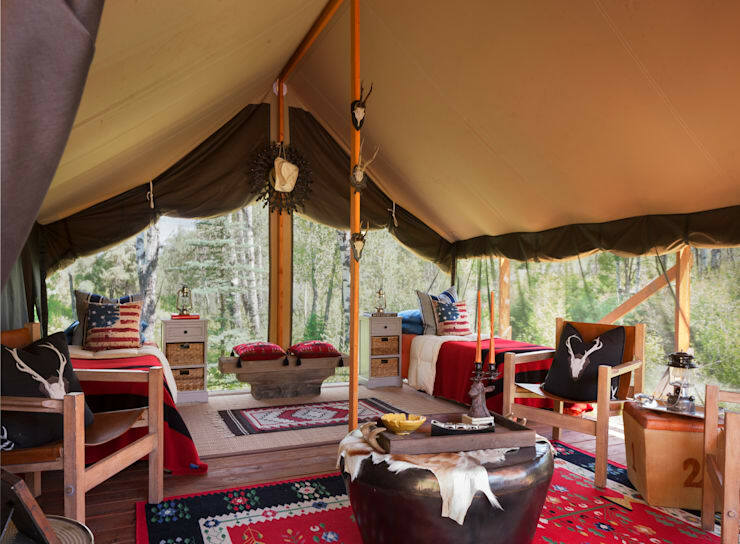 Enjoying an idyllic location near a creek, this yurt-like structure offers an additional degree of connection with nature, its wood frame and canvas covering allowing the breeze to move freely through the space. 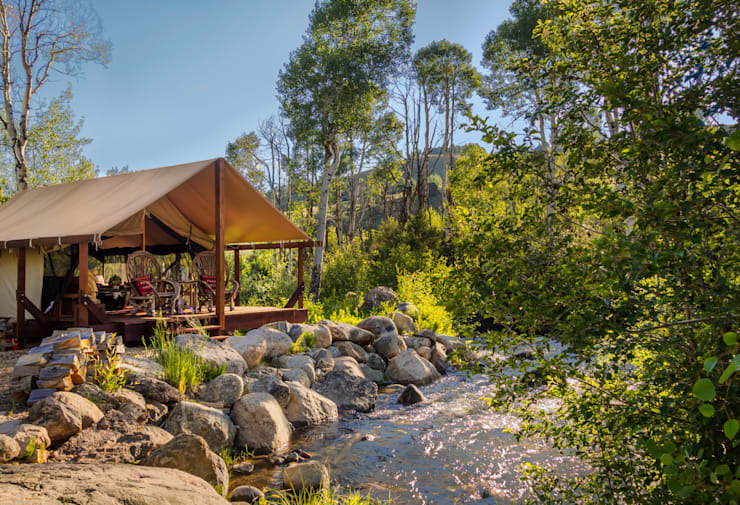 Under a waterproof shelter, this little getaway packs away everything you might need for a comfortable retreat, furnished with beds and chairs arranged into a sleeping area and a social area. Woven rugs fill the room with intricate patterns, with a collection of cowboy-esque features adding to the room’s rugged Southwest vibe. Wooden materials and wicker furniture mirror the organic environment, creating a highly sensory space that draws attention to the basic elements of water, Earth, and air, allowing you to come into close contact with the sights and smells of the forest. 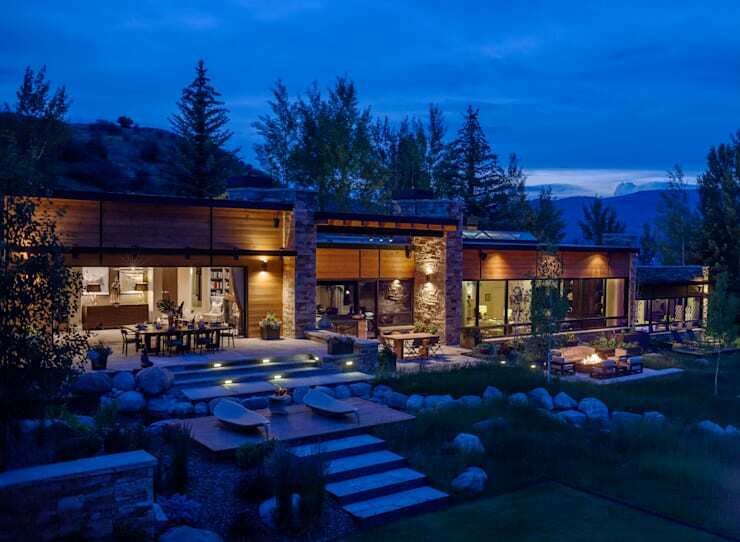 Share your thoughts on this mountain home below!